A system that creates an investment portfolio based on a level of profitability and risk ratio set by you. 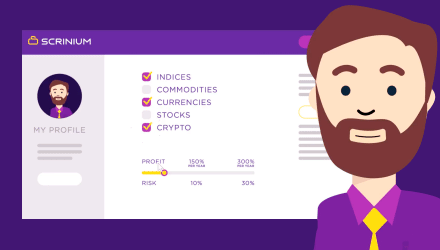 Which assets will be available: stocks, bonds, currency pairs, CFD, derivatives, cryptocurrencies? Where will the assets of your customers be stored? How will their security be ensured? Will you release the system's prototype? We're working on a public prototype now and are planning to release its first public version no later than February 2018. Which technologies is your system based on? Ethereum technology for storing data in the blockchain. An off-chain Raiden Network solution for higher speeds of transaction recording and lessening the costs of transactions. IPFS/SWARM and BigchainDB/IPDB* decentralised databases for data recording and storage. *We'll choose the best technology based on the results of tests performed during the Scrinium development stage. Why do you need blockchain in the system? To provide security and transparency for Scrinium transactions. How does Scrinium generate profit? Liquidity providers pay us commission for traded volume coming from the Scrinium platform, which is a classic set-up within financial services. We split this payment into system profit and traders' rewards for successful trades. Does the investor have to pay any commission to Scrinium? Our unique proposition for investors is that you don't have to pay extra fees to Scrinium. If you are an investor, there's no fee for creating an account and we don't deduct anything from profitable transactions. Why will traders be motivated to join Scrinium? 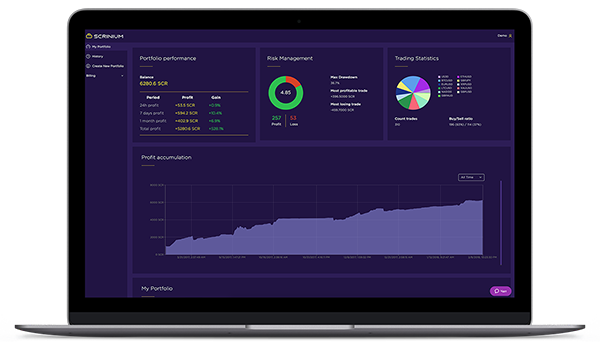 Traders receive rewards for trading regardless of the platform/broker the trader uses - they only depend on the profitability of the trades. Moreover, coin value grows with time and the platform's popularity, making SCR your invaluable asset. Can you demonstrate how AI works? For now, you have to wait for the public prototype release to see it in action. Meanwhile we're training it to analyse trades according to their profitability and calculate risks of those trades.